A girl who dreams her next day. A guy who can't escape the demons of his past. Together they take on ultimate evil to save their world. Nara Collins is an average girl with one exception; every night she dreams the events of the following day. Due to an incident in her past, Nara avoids using her special gift to change fate...until she dreams a future she can't ignore.After Nara prevents a bombing at Blue Ridge High, her ability to see the future starts to fade, while people at school are suddenly being injured at an unusually high rate.Grappling with her diminishing powers and the need to prevent another disaster, Nara meets Ethan Harris, a mysterious loner who seems to understand her better than anyone. 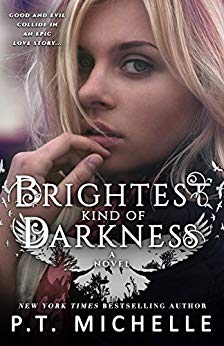 Ethan and Nara forge an irresistible connection, but as their relationship heats up, so do her questions about his dark past.Books in the BRIGHTEST KIND OF DARKNESS series are best suited for upper YA readers 16+ :* ETHAN (Prequel Novella)* BRIGHTEST KIND OF DARKNESS (Book 1)* LUCID (Book 2)* DESTINY (Book 3)* DESIRE (Book 4)* AWAKEN (Book 5) - The epic conclusion to the BRIGHTEST KIND OF DARKNESS series Note: It's best to read ETHAN after you read BRIGHTEST KIND OF DARKNESS.